WHAT IS COLD LASER AND LOW LEVEL LIGHT and laser THERAPY? Imagine if you could get all of the benefits of the sun, deep within the body, without the harmful ultraviolet rays. That's one of the easiest ways to explain how Low Level Light and Laser Therapy benefits the body. Near-Infrared (NIR) polychromatic spectrum has been well studied since 1960s and have been documented through thousands of fundamental research studies to analyze the effects of NIR on tissue repair and rejuvenation, as well a pain relief mechanisms. 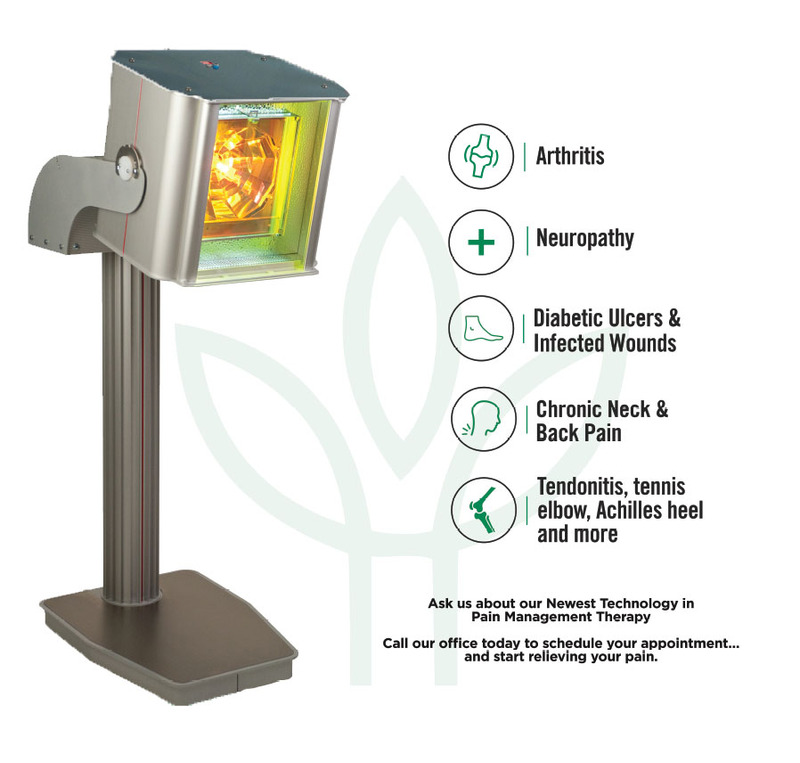 NIR photobiomodulation therapy is a non invasive, and highly effective adjunct therapy in the field of prevention as well as in healing.. 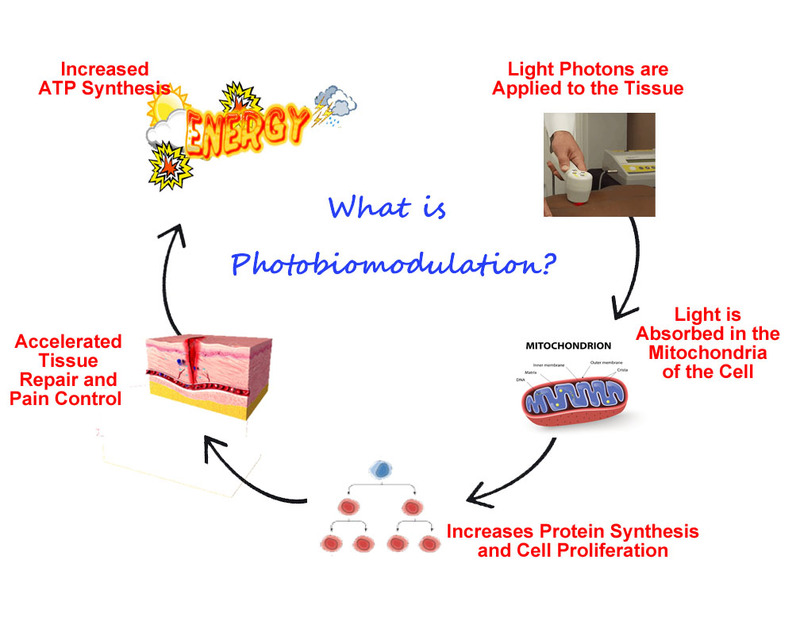 Effective photomodulation wavelengths ranging from 633nm to 1128nm are employed for the maximum penetration depth to be effective on the fibroblasts in the soft tissue and osteoblasts in the bones. This is often referred to as Cold Laser and Low Level Light and Laser Therapy. What are Some of the Conditions Low Level Therapy can Treat? ...The super-pulsed GaAs (diodes) in GaAs lasers give deep penetration without the unwelcome effects of Continuous Wave (lasers) such as thermal damage, as well as allowing for shorter treatment times. Harvard University - "The Effects of Pulsing in Low Level Light Therapy"
Dilation of partially obstructed blood flow vessels to transport higher volume of oxygen and nutrients for the initial therapy to begin. Cytochrome-C oxidase (COX) is a large trans membrane protein of the inner mitochondrial membrane. Irradiation of COX increases the activity of the mitochondrial respiratory chain producing more adenosine triphosphate (ATP). It's believed that NIR irradiation may increase the amount of available COX over time. Higher ATP amounts trigger proliferation of fibroblast cells for increased collagen fibers, elastin and fibrin. Antibacterial effects by induction of reactive oxygen species (ROS). ROS are involved in cell signaling, enzyme activation, nucleic acid synthesis, protein synthesis, and the activation of transcription factor. Anti-inflammatory effects of NIR therapy can be explained by inhibition of prostaglandine, interleukin, and cytokine in cell models. Increased platelet activity occurs for faster wound closing. Adhesive protein is delivered to the inflammation site. Re-epithelization enhanced for covering the open wounds. NIR released NO (nitric oxide), which induces endothelial cell migration by activating growth factors and improved perfusion. Homeostasis occurs and followed by the new blood vessle development. NIR light spectrum also increase the diameter and blood flow velocity of the peripheral arterioles and will enhance the microcirculation. Increases the speed of mitosis, facilitating cell multiplication to aid in the new vessel formation. Improves viable proliferation of fibroblast cells. Stimulation of cell division and cell growth of fibroblasts plays an important role in wound healing. 980 nm: Stimulates deeper lymphatic drainage. Is Low Level Light and Laser Therapy Safe? Yes, Low Level Light Therapy is completely safe, drug-free and non-invasive. All of our Cold Laser and LLLT devices have an FDA Clearance and CE certification, a mark of European safety and legal compliance. 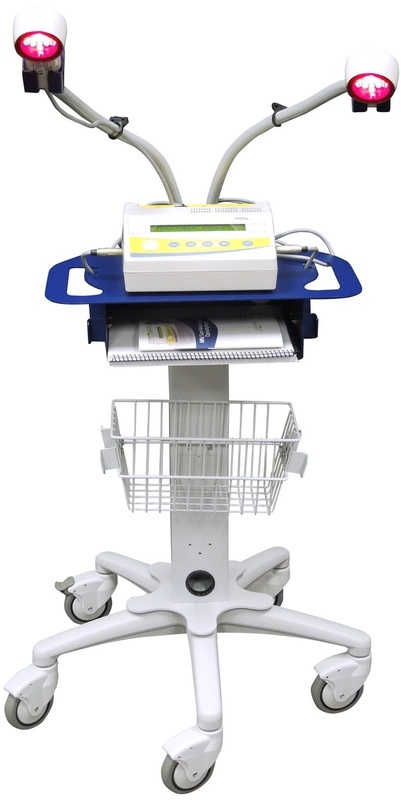 However, it is recommended that the devices not be used directly on any neoplasmic tissue. Pregnant women should refrain from laser treatments applied directly to the abdomen. Also people with pacemakers should not use laser treatments near the heart. The only known side effects at this time is that some medications can cause photosensitivity that can lead to sunburn-like symptoms, a rash, or other unwanted side effects. How Deep Into the Tissue Can the Light Penetrate? The level of tissue penetration by the Cold Laser and our other LLLT devices depends on the beam’s optical characteristics, as well as on the concentration and depth of the chromophores, which are absorbed at different percentages according to the laser light’s wavelength. Several factors affecting the depth of penetration are the technical design of the device, the particular treatment technique used, the tissue type being penetrated, skin pigmentation and foreigh substances on the skin surface such as creams or applied oils. Bone, muscles and other soft tissues are transparent to certain laser lights, which means that light can safely penetrate these tissues. The radiation in the visible spectrum, between 400 and 635 nanometers, is absorbed by the melanin. 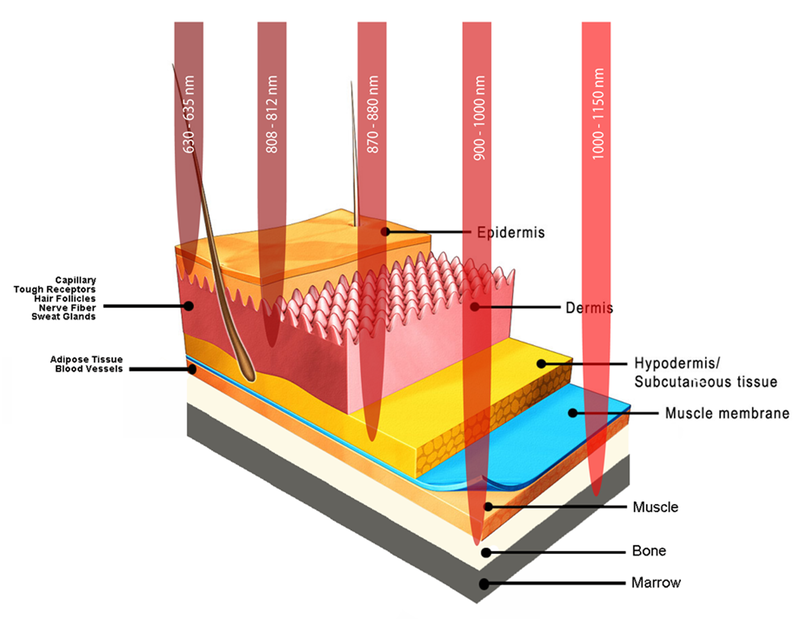 In the infrared, a narrow band, which extends approximately from 650 to 1,200 nanometers, is the so-called “therapeutic window”. That is the reason why our cold laser and LLLT devices have wavelengths within the 600-1,200 nanometer. The lower the light wave the shallower the penetration. The higher the light wave within this therapeutic window, the deeper the penetration. Considering all of the factors above, our light and laser devices can reach as deep as 5 inches, which typically is sufficient to stimulate healing and pain relief for most conditions noted. 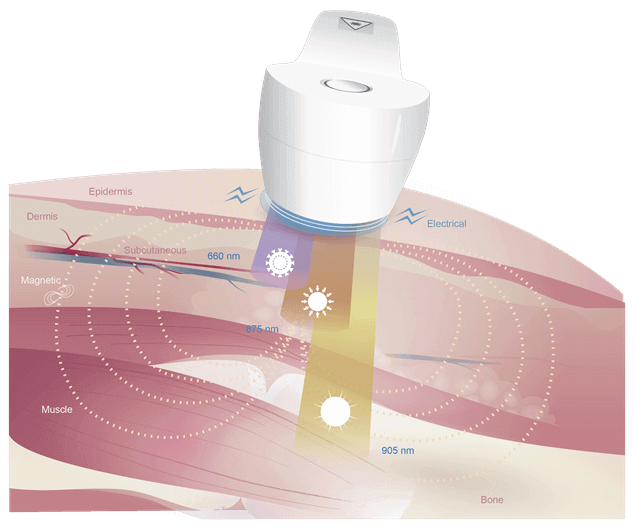 Learn about the most advanced laser made today, the MR4 at the MR4 patient website by clicking here. The Low Level Light and Laser research continues to amaze us with its stimulatory effects, and has uses beyond those treated at Gallagher Chiropractic and Wellness. Our Chirporactors and Low Level Light Therapist continue to study, and educate themselves on the best practices associated with treatment. The articles below will give you some insight as to the benefits that can be realized from Low Level Light Therapy. Make an Appointment with Gallagher Chiropractic and Wellness Center Today! Dr. Gallagher and his staff have been helping people get healthier for over 20 years. At Gallagher Chiropractic and Wellness, we have a unique philosophy and approach, customizing each treatment to the specific needs of the individual patient. Call us at (704) 542-6500 or contact us today to set an appointment to begin your journey to greater health…naturally. Tell any of your family or friends that can benefit from this technology. They will be glad you did.Gallagher Chiropractic and Wellness is located at 7810 Ballantyne Commons Pkwy #101, Charlotte, NC 28277.